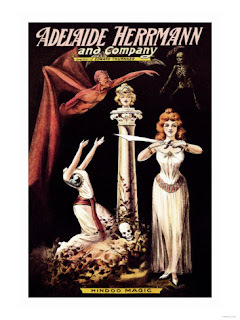 A while ago I mentioned that Margaret Steele had published the recently discovered memoirs of Adelaide Herrmann. But at the time I had not read the book. I was unaware that the book would be released not only in a hardbound edition but also in trade paperback version. This is exciting news because the book is much more affordable and easily accessible. The bulk of this book (30 chapters) was written by Adelaide Herrmann. These were the Memoirs of her life with Alexander Herrmann and then her own career after he passed on. Sadly, she did not quite finish the book. She did complete the section on her life with Alexander but the part about her own career stops at a particular part which I plan to cover in a separate blog later. Margarete Steele edited the book and then gathered additional information, such as all the articles that Adelaide ever wrote on magic and reprints of newspaper articles and similar articles of interest. There were no corrections in the language of the times, so there are occasions when Mrs. Herrmann was not politically correct by modern standards. As to the content of the book, it is simply amazing. I've always enjoyed the brief biographies of the Herrmann's that appear in various magic books, but always yearned to know more. In this book, we learn that there was a rivalry between the two brothers Compars and Alexander and that they didn't speak for a period of time. I'm not sure still if they reconciled their differences. Adelaide implies they did but it's really tough to say. One of the things I love about Alexander Herrmann was that he chose to a magician both on and off the stage. He was 'street magic' 100+ years before David Blaine and others were even born. He would cut open fruit to find coins inside while at a market. He would often produce a diamond ring from a biscuit or piece of bread, which had backfired on him on one occasion. A waitress took the ring and did not want to give it back! Alexander had to plead with the restaurant owner to retrieve his ring. I was fascinated to learn that Alexander Herrmann was doing the 'muscle pass' with a coin as far back as the 1890s. For some reason I thought this effect was a bit more modern, but Adelaide properly describes his method for causing a coin to apparently float up from one hand to the other through the use of muscle control. Adelaide doesn't go into specifics on the amount of money that Alexander made over the course of his lifetime but it had to be millions. He invested in theatres long before that kind of thing was popular. The Herrmanns you see were on the scene before Vaudeville came about. Herrmann's idea of buying theatrical properties and putting shows in them was just ahead of it's time. Herrmann was also very generous and on more than one occasion took it upon himself to help pay expenses for other performing troupes. His generosity and his excessive spending had left them with very little money at the time that Herrmann passed away. It's clear that the hope was the restore their money by the end of their tour, however Alexander died midway. In the book, The Illustrated History of Magic by Milbourne Christopher, there is a wonderful photo of Herrmann's house, known as Whitestone Manor on Long Island Sound. There is an even better photo of it in the book. It's a beautiful property but apparently, Herrmann only leased the property he did not actually own it. Herrmann loved purchasing extravagent items like his Herrmann Railcar. This train car was originally owned by actress Lily Langtry and Herrmann purchased it from her. The book contains photos of the interior and the exterior of the train car. As it turns out, Alexander Herrmann would die upon this train car in December 1896. They also owned a yacht which they called Fra Diavolo. After her husband died, she went out on her own, first with her nephew Leon and then as a solo act. Apparently, she never spoke on stage, all of her work was done silently. She also incorporated special dances into her act as well. Her husband was known as an excellent sleight of hand artist and while he was alive Adelaide never ventured into that part of performing. But after he died, she began to learn and develop her own Billiard Ball Manipulation act, which takes a great deal of skill. Adelaide and Alexander were remarkable people from a unique time in history. They were performing during the days of the Wild West right up until just before Vaudeville started. Eventually, Adelaide became a popular Vaudeville attraction in her own right. This book is a must have for any magic historian or magic enthusiast. Margaret Steele has done a fine job which really feels like a labor of love from all parties involved. I saw the book listed on the Barnes & Noble website so it's even available to the general public which is exciting. For the price, you just can't beat it! Thanks for the information. Looks like another addition to my magic library.